As part of its ARCore push this week, Google has promoted Just a Line from one-time AR experiment to a full-fledged app. Available now in the Play Store, the dead-simple augmented reality drawing app makes the old Microsoft Paint app look like Adobe Illustrator. 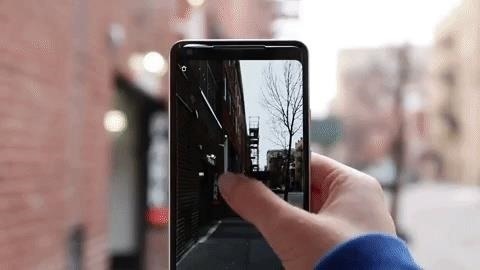 After the app establishes the user's orientation to the floor, users simply hold their fingers on their smartphone's screen and move the device around their environment to draw lines. Users can lift and replace their fingers in order to draw multiple lines, and there's an undo button to erase the last line drawn. As far as palette goes, users can pick any color they'd like to draw with, as long as it is white. The drawn lines maintain their position in space, and users can then capture images or film video of interactions with those floating lines. Built by Google Creative Labs and Uncorked Studios, the app was one of 16 AR experiments trotted out by Google as part of its announcement of ARCore last year to showcase how developers could deploy the technology beyond place 3D objects on a floor. If you're a developer and think you can offer something more robust, the source code for the open-source experiment is available for download. In fact, alternatives like PaintAR and Paint Space AR already exist on the Play Store, along with a plethora of options on the App Store for iPhone and iPad users. But this app is so easy to dive into it's hard to resist.